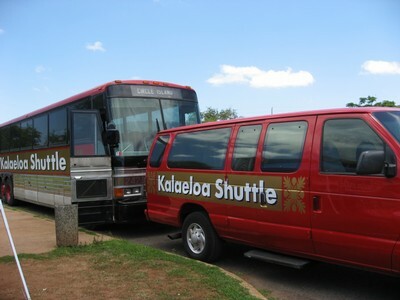 Two donated buses and two 15-passenger vans will serve as shuttles from Kalaeloa transitional centers to a transit hub and through Kalaeloa. Photo via Hawaii Community Development Authority. Kalaeloa, Hawaii is starting a free shuttle service to help the area’s poorest residents get around and reach its largest transit hub, which services nearby Honolulu. Every day, extremely poor people who need to make it to work (many homeless people, after all, are working poor) and back to a shelter often don’t have the change or access to transit to take them there. Un-walkable towns and cities don’t help; poor sidewalks and pedestrian-crossing infrastructure in many cities make walking especially dangerous. These transit troubles inhibit poor people from finding work or making greater profits by limiting their access to cities’ downtown districts. They encourage people to sleep in the streets in some sprawling cities, and they can make them miss meetings or interviews and arrive late to their jobs. To call attention to the plight of area homeless people and work toward alleviating it, Kalaeloa, Hawaii is starting a free shuttle for homeless people. The shuttle, set to begin running August 9, will service more than 500 residents of homeless and transitional shelters, taking them through Kalaeloa and to Kapolei Transit Center, where they can continue on to Honolulu. The project is managed by Hawaii Helping the Hungry Have Hope (H-5), and operation costs — estimated at about $148,000 for the first year — are being covered by the city, state, and a group of nonprofits with matching federal funds. Eventually, organizers hope to expand routes and provide more nighttime service. The shuttle committee is also proposing a family pass for the shuttles, which would give a fixed rate for large families who want to take advantage of the service.